I use a 2006 R350 that needs brake service. Brake service message is appearing in my car, so I believe I need regular brake job - brake pad & rotor replacement. The MB dealer estimate is around $2100 - instead I want to use a local mechanic/shop ( MIDAS ). What's the recommendation - is there any risk getting it done inexpensively by a local shop? Better by a local independent Mercedes mechanic ... who is likely to have seen a Mercedes before. ditto. yet there is nothing special about mercedes brake jobs.. if they can get the parts fast enough including the wear indicators. better to go to an MB experienced indy. Key is also proper DOT 4 + fluid.. I always use MB OEM. used regular dot 4 name brand but abs warning came on.. had to flush with MB. I don't have at hand the cost of my most recent brake job, but that quote sounds really high. I had it done by a local German car repair shop who knows Mercedes. I can't say that I would recommend Midas. Does the R class vehicles have the SBC brake by wire system like the 2006 E and CLS class cars? I am looking at an 06' R500 and the LR rotor looks to be grooved. Thank you! I just had rears done on my R500, and it was $272, but I dont think I had to do rotors, just pads and hardware. Also, did not have to flush brake fluid this time. FWIW, I went to Brakes Plus, but I have used them for years and know the guys. Not sure how I would feel about using a different, non MB, shop. One thing I can say for sure, the OE pads are crap. They're probably the dirtiest pads out there short of carbon kevlar racing pads. Also, make sure your installing a decent ceramic pad, not semi-metallic. ATM, my R has the OE pads on the front and a set of the $25 economy ceramic C-TEK's (#10311220) from Rock Auto on the back. I had to change out the rears along with the rotors about a year ago. Now, the factory pads dust out the front rims after no more than 100 miles, I cant wait to change them out. What a PITA. But on the rears, the rims are still pretty clean and looking good after 300-400 mi, no doubt because of the ceramic pads instead of the OE. I had the same problem with the OE pads on my SLK55. But since the calipers are the same oversize 6 pot setup as on a CLK63, I ended up going with the premium Disk Italia / Akbono hyper ceramics F & R pads. No dusting at all with those. But they set me back over $300, pads only no labor. It looks like the Akbono ceramic's are available for both the front & rear on the R for about $130, so I'm exceptionally pleased with the results I'm getting from those C-TEK's on the back of my R.
Last edited by Lioninstreet; 02-27-2019 at 02:15 AM. As mentioned, there is nothing special about the R-Class brake system. I would go to a reputable independent repair shop. I tend to avoid chain shops like Midas. 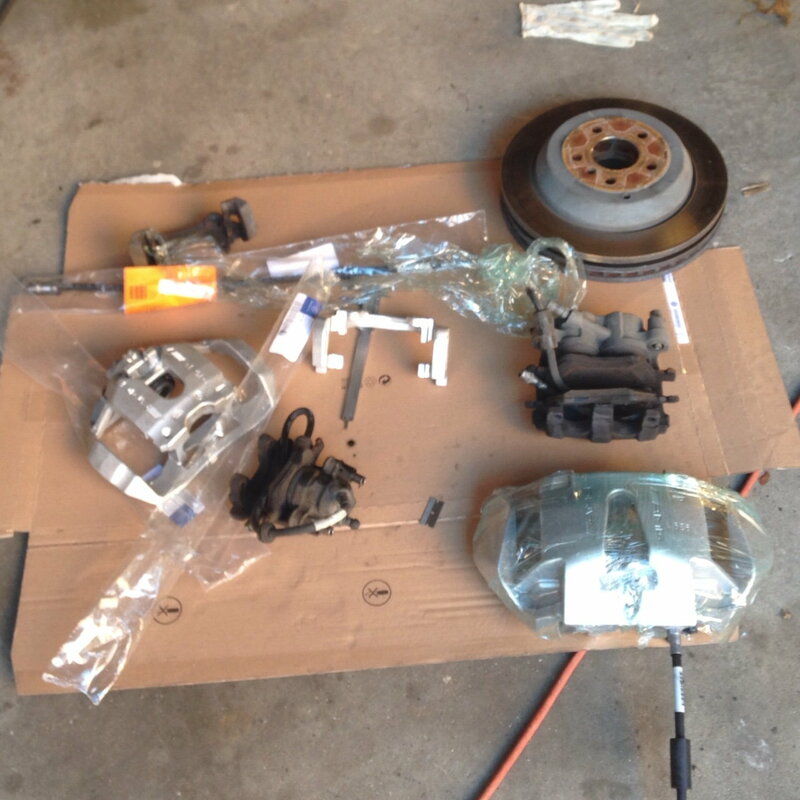 I personally swapped the brakes on my R350 to the R63 Rotors and Calipers. The only issue I had was bleeding the brake system. I completely replaced the fluid. I had to use a pressurized method at the booster. Other than that - it was 123. Hello, I have an early 06' R500 with unfortunately the small R350 13.0" front rotors and 13.0" solid rear rotors and would like to know if the R63 rotors and calipers would fit? If so is it just the fronts or will the R63 rear brakes fit as well? Do the wheels need to be larger than 17" for the R63 brakes to fit? Thank you!! Very much in need of a brake upgrade. My '12 also has the second row console and the non vented rear rotors. Merc seemed to use the thinner (non vented) rear rotor on R's that didn't have the 7th seat. One thing for sure, after experiencing the difference with oversized brakes, I'd like to move in this direction myself. I have never measured, but my guess would be a 17" wheel would be too small considering the standard factory ML63 wheel size was 20" on the 07-'10 & a 21" was optional for '09 - '10. Upgrading just the front could be done. But both front and back would really put some whoa in our 2.5 ton sleds. Also I'm pretty sure the R & ML63 master cylinder is the same. Maybe rodneyc77 could confirm. On turbocad6's very informative thread on his upgrade to the S class 8 pot / 4 pot calipers https://mbworld.org/forums/r-class-w...de-brakes.html , I seem to remember him either needing to make brackets or machine clearance into the calipers. I don't think they were a direct bolt on. At one point last year, I tracked him down to see if he would do the mod on a set of calipers I was going to buy, but he was concerned about liability issues and declined. Interesting comment about 7th seat and slotted rear rotors. Our 08 R350 has that arrangement. Yes, it's basically plug and play for both fronts and rear calipers. Of course, you need rotors, brake pads and the calipers for the R63/ML63. You need minimum 20" Wheels. The rotors for the R63/ML63 are almost 16" diameter alone. Yes the master cylinders are the same. The only concern was that the front knuckles had different part numbers and I took the risk on purchasing the calipers and if they didn't bolt up I was willing to get a bracket made or purchase the knuckles from the R63. They were around $500 a piece 5 years ago. I was determined to get it done. Looks like the ML63 rear is also single piston, just a larger pad. Am I seeing that right? Thank you for the information! Did the OE knuckles work without having to be changed to R/ML 63 steering knuckles? I know currently the weenie caliper's on my R500 are right to the inside of the 17"wheels. My CLS55 AMG has the factory 19" wheels and houses the 8-piston brembos. But those are monoblock fixed calipers vs floating type in the R/ML63's and are dimensionally different. Correct, the OEM Knuckles worked. Awesome on the OEM knuckles working! I will have start looking for some 20" wheels. Anyone know if 19" wheels will clear the R/ML 63 brakes? Many thanks for all the information!